I recently got a question on my addition resp grant post from Donna – she brings up a number of interesting points which I’d like to address. 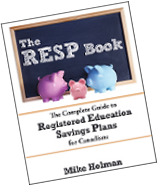 If you want to read any other posts on resp then check out the main resp reference page. Hello. I have 3 children, 15, turning 17 and an 18 year old. I am divorced and we had to liquify our RESP 12 years ago. Since then their father had passed and left a little insurance money. RESP now and can it be backdated?? Any suggestions? First point (and most important point) is the concept of investing time horizon. If you are investing money that you need in a couple of years then you have to invest in something that is not risky in order to ensure the money will be there when you need it. In Donna’s case I would just put the money in a high interest savings account or short term bonds (via etf or index fund) since her youngest will be going to school in 2 or 3 years. 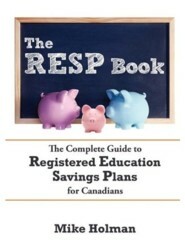 Buy The RESP Book on Amazon now! The last year the resp contribution grant can be paid is in the year the beneficiary turns 17. If you set up an resp for the 18 year old then the main benefit of government grants won’t be available. The tax sheltering might still be useful but only in certain cases. If you are in a high tax bracket (ie 40%+) and will be contributing a significant sum of money – let’s say $10k. Then you will be saving roughly $120 taxes per year (assume 40% rate on 3% interest). The interest portion of the account will be taxable in the child’s hand when withdrawn but as long as they are in a lower tax bracket then you will save some tax money. This benefit is pretty debatable – all it takes is one good summer job and the tax benefit mostly disappears. I’m not sure that I would bother with an resp for the 18 year old especially if the money is going to be used in the next year or two. By the description “turning 17” I’m assuming the child is turning 17 in 2009. There are special rules for 16 and 17 year olds with respect to the government grants which mean that this child won’t qualify. At least $2,000 must have been contributed to an RESP for the beneficiary before the end of the calendar year the beneficiary turned 15 and not withdrawn. At least $100 must have been contributed to an RESP for the beneficiary in each of any four years before the end of the calendar year that the beneficiary turned 15 and not withdrawn. From the comment it appears that all the previous resp contributions were withdrawn which makes this child ineligible for any grants. My previous comment about tax sheltering for the 18 year old are still valid for this child. Finally some good news – the 15 year old is eligible for the 20% government grant for this year and the next two years – but only if $2000 is contributed this year (see above rule). Donna asked about “backdating” the contributions – the resp rules allow you to receive up to $500 of grants per year for past years in addition to the yearly maximum of $500 in grants for the current year contribution. Put simply, Donna can contribute $5,000 for the 15 year old in 2009 and will receive $1,000 in grants. Then she can do the same in 2010 and 2011 – at that time she will have made $15,000 in contributions and received $3,000 in grants which is well worth the effort of setting up the account. In this case the tax sheltering effects are even more beneficial than for the older kids. If she doesn’t want to contribute the maximum then I would suggest contributing a minimum of $2,000 this year otherwise this will be the last year the child will be eligible for grants. Donna didn’t say anything about income but if your family income is below around $78k then you might be eligible for additional resp grants which could mean grants of 30% or even 40% instead of the basic CESG rate of 20%. This of course would mean more grant money for the 15 year old. If I were in Donna’s shoes I would make sure first and foremost that I didn’t invest in anything with any risk at all (resp or not) – there just isn’t very much time until this educational money is needed. Secondly, I would definitely open an resp for the 15 year old because there is a lot of potential grant money available. I don’t know if it’s worthwhile opening resps for the other 2 depending on other factors discussed. The 15 year old is the only one who will have a clear benefit from an RESP from the information given. I would also find out if she was eligible for any extra grants. We have our children’s RESP money invested in a money market fund. My experience has been that the banks don’t want to encourage self-directed RESPs (because they want to sell you one of their products), but they do have them. Within self-directed RESP’s the investment options tend to be really limited. For example, it wasn’t possible for us to purchase GIC’s. Obviously, a money market fund doesn’t provide very much in the way of return, but we since have been able to avoid all of the market declines, I am pretty certain that we are ahead compared to most other RESP savers. It does irk me somewhat that while the principle of an RESP is conservative, it is very hard – and totally not encouraged by the banks – to find investment options with a matching conservative risk profile. Philippa – you should shop around – I’d be surprised if you can’t buy GICs in an resp at every bank. CC – good point. Thanks for the link. Firstly, great site – thank you. Couple of questions about RESP’s I have 2 grand children – one 3 and the other 1yr old. The 3 yr old has an RESP opened by her mother with about $8,000 of which I contributed $6,000. I am thinking of creating a family RESP for the 2 grand children. Can we roll the 3 yr old’s RESP into the family plan? What has to be done to do this? The parents and the children may take a 2-3 year foreign work assignment. can I still contribute to the family plan RESP and get up to the maximum grants? 1) Who will be the owner of the family account? If the existing owner (your daughter) will be the owner of the new family account then there will be no problem asking the financial institution to transfer the individual account money into the family account – I’m not sure about transferring to a family account with a different owner (ie you). 2) The kids have to be residents of Canada to get the grants so I would suggest contributing as much as you can before they leave. Save your money when they are gone and then resume contributions. Great post! Very clear and helpful. I was wondering if there was somewhere online that I could check and see how much I’ve contributed. I started contributing a number of years ago but didn’t keep very detailed records. A couple of years ago, I started contributing to a different bank. My sister (the beneficiary) is turning 17 this year, so I wanted to see how much I’ve contributed and how much grant I’ve received. Any ideas other than trolling through all my financial paperwork? @Michelle – You can phone the HRSDC at 1 888 276 3624. They will give you all the grant and contribution room (since 1998). Can you withdraw from an REsp before the beneficiary makes their first withdrawal which will be in the same year as the with drawal? @Laren – I don’t understand your question. Suppose an RESP has been set up for a child when she was 10. Now she is 18 and will be 19 before the end of the calendar year. In July, some monies were withdrawn from the RESP to pay for first semester’s tuition, etc. Is it possible to contribute to this RESP even now? The reason I am asking is that I find it easier to grow an investment portfolio when there is more $ to invest. And with the recent turmoil in the markets, there are opportunities now that didn’t exist a few months ago. Hi CF. You are allowed to still contribute to her RESP, but she is not eligible for a grant. my kids are 15 and just turned 17 in oct there father passed in april leaveing them 35,000.00 each.there stepmother is in charge of the money and has put it into an resp,together making it a 70,000.00 resp my question is both my children are wanting 5,000.00 each now for themselfs and i want to know if there would be any problem or taxes taken if they with drawl from this resp now. I have some concerns and need your help in this. I have contributed in children’s education fund inc RESP for my daughter since 2006 and my plan is maturing on 1st June 2012,. My daughter has started university in 2011 and will be ending her post secondary education in 2014. In this year i.e 2012 I will be getting payment of my savings and in 2013 1st EAP and in 2014 2nd EAP. Last year I contacted customer service representative to change my phone number as well as Maturity Date, and representative advised me that there should be a contribution for minimum of 6 years and told me to keep the maturity date as it is and now when I contact them for last EAP which will be in 2015 they say that if my daughter will be studying she will be eligible or else I will have to forget my last EAP which is approx $3000. One thing i dont understand is why is the maturity date set for 19 years? at the age of 18 student starts uni / college and it is assumed that in normal case they will be enrolled for min. 4 years, so in my case if the maturity date was in june 2011 the question of loosing last EAP would have never arised. @san – Group rrsp companies have their own various rules about these plans. It really sounds like this was an inappropriate investment for you since you started too late to be able to collect the final year of EAP, which is a huge penalty. I’m guessing you didn’t understand these rules when you signed up or you likely wouldn’t have. Not sure exactly what you can do – I would complain to the company or perhaps a financial ombudsman or even someone like Ellen Roseman of the Toronto Star. Can you tell me how long it takes to actually obtain the money from an RESP if you decide to withdraw just a portion but keep contributing. My daughter is 15 so I want to take some out but not lose the RESP. She turns 16 in January 2013.
what is the last age for which RESP contributons are allowed? Is it possible for 2 unrelated people to be the subscribers for an RESP for their child? Divorced several years ago. An RESP remains in place for son but no contributions have been made since divorce. Both parents are still subscribers on the account. The investment institution recently changed rules and now says premium investment fees must be paid yearly on this account (way more than any financial gains possible). Bank related to the investment institution says if account is transferred to the bank, only one person can be subscriber. Ex spouse wants to take full control of the account. I have been advised this is not a good idea as the other spouse can then remove all money, except for the CESG. Why can the account not be transferred out of the expensive investment institution with both subscribers still on board? @christine – You won’t be able to set up the new account as joint subscribers because you aren’t married any more. Another option is to set up separate accounts for you and your ex and just split the RESP account assets into the two accounts. That’s what I would do. I am so glad I stumbled upon this article. I was simply looking for information on past contribution accrual but it’s almost like the article was written for me as I have one 17 year old and one 15 year old both with no past RESP contributions. Looks like I will be maximizing an RESP for my 15 year old next week – must move quickly as the year is almost over. Next post: IRS – Late Filing Tax Return Penalties – Need Some Motivation?